Poas Volcano Park is located in Alajuela city, It has an area of 6,506 hectares, its access is very easy and the road is in very good condition; Poas Volcano is one of the most spectacular volcanoes in Costa Rica, its extraordinary scenic beauty is the greatest attraction of the area, here you will find a wide variety of vegetation from one area to another. The origin of its name is still unknown, some people say that it can be derived from the Latin name "puas", due to the presence of some plants with barbs in the zone; Others comment that its name comes from a town called "Púas" located near the massif, but the exact history of its name is unknown. Admire its main crater is a spectacle for sight, this is considered as one of the largest in the world, with its 1.5 km in diameter and 300 m deep; In addition, it presents in the bottom a hot circular lagoon of about 350mts of diameter rich in sulfur and acids. Also has a cone of slag or comic structure that rises about 40mts above the lagoon and has very active fumaroles. 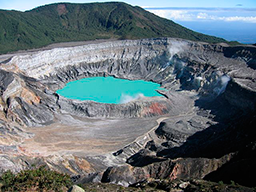 The second crater is the base of the Botos lagoon, with cold water and of purely rainwater origin; which drains into the Caribbean through the Angel River, a tributary of the Sarapiquí River. The fauna in general is very unusual by the type of climate that predominates in the zone, and the birds are more abundant than the mammals. Sombrilla de Pobre trail: this has a distance of 600mts and takes about 10 to 15 minutes to travel, this trail will take you to the main crater observatory of the Poas Volcano. In addition, you can see fumaroles indicating the permanent activity of this volcano and the Cone von Frantzius, the oldest eruptive focus at the top of the massif. Laguna Botos: This trail has a distance of 800mts, and to walk along it will take you about 30 minutes, here you will enter to the cloud forest, where you could observe a great variety of plants of different species, until arriving at Botos lagoon, this is an old crater of 14mts of depth and 400m of diameter with crystalline and cold waters, of these waters is that it supplies the facilities of the park. Escalonia: This trail will travel in about 20 minutes, are around 530mts in the forest, where you can enjoy different kinds of flora and some birds. Poas Volcano National Park has trails, observatories, coffee shop, souvenir shop, health services and picnic areas; besides offering some facilities for people with physical disabilities, as well as service of guided walks in the morning and at night. Remember that in Costa Rica National Parks were created in order to protect our natural resources, therefore, it is not allowed to extract plants, animals, rocks and other materials of the place. Respect and comply with established signage; Please do not feed the animals or leave food residues on the way. Food consumption should be only in the picnic area. No pets allowed. And the water in National Park is not drinkable. The schedule is from Monday to Sunday 08:00 am to 15:30, including holidays.